It's Wordless Wednesday at 5 Minutes For Mom - stop by for lots of fun pictures! I know you've seen a lot of Buster lately, but I couldn't resist posting this pic! 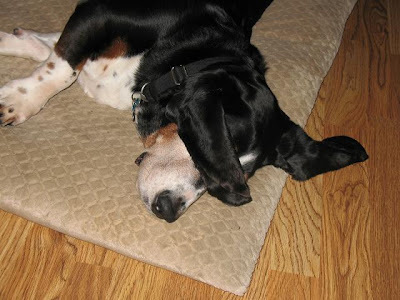 Advantage of Basset Hound ears: built-in sleep mask to keep the light out (so he can get his "beauty" sleep - LOL)! Cute! My Maggie gets so annoyed with me when I mess with her when she's sleeping! "THAT" is too funny! Love the picture. I hope you'll swing by my site, The IE Mommy, to see my WW entry and to enter our photo poster giveaway! Thanks for sharing. Awww. He's so cute. How's my friend today? So when are you taking a little break? I'm not sure if I'll be able to handle it! LOL. Big Basset Hound Size hugs to you! How else can you nap during the day if you can't block out the light?? That's a smart puppy! NIce feature of the long ears! oh, to be so comfortable!!! Oh too cute! They have such a rough life, don't they?!?! Where can I get one of those built-in masks? I need one!